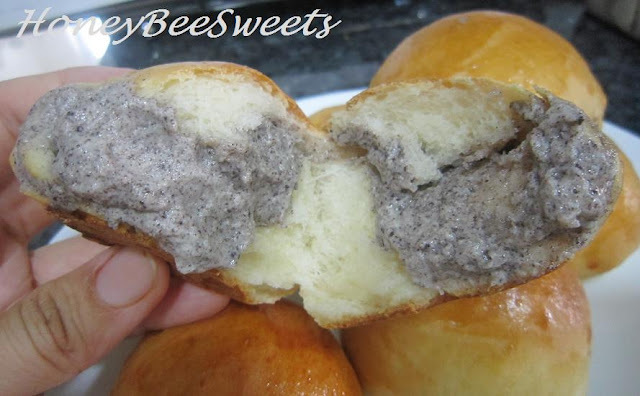 If you have been to those chain bread stores in Singapore mall, you will notice they sell similar mini buns like mine. The bread store usually offers deals like buying 3 or 5 of these mini buns / pastries for a slightly cheaper price. Yeah, I am a big time sucker for those! 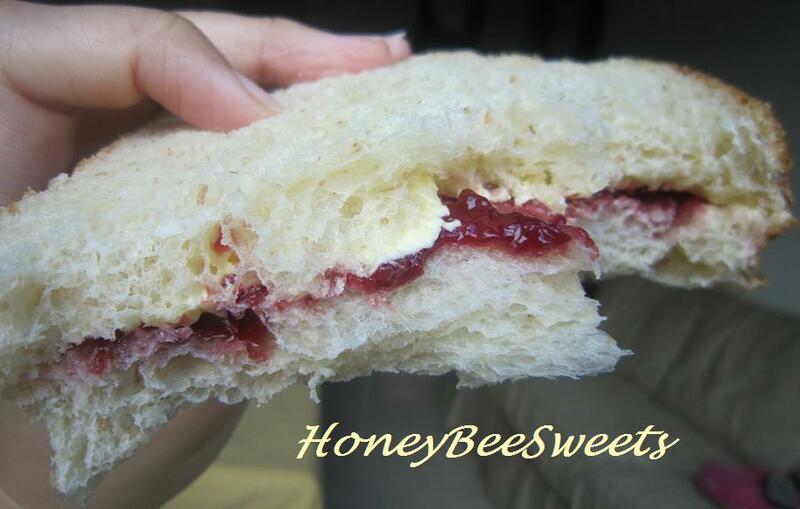 Will usually pick like a variety especially since my little ones also enjoy those breads too. 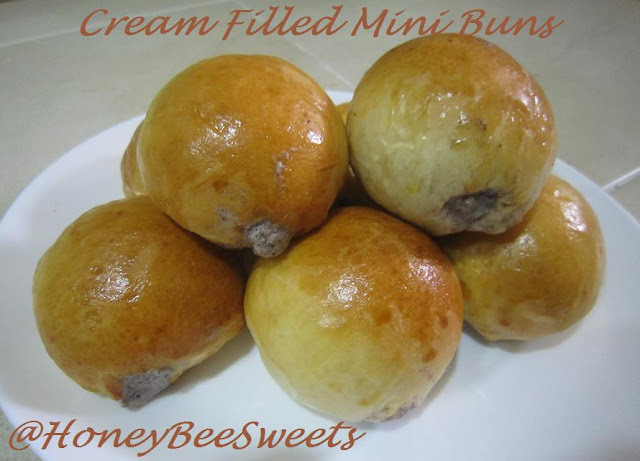 So this time round, I decided to give this mini cream filled buns a try. Although in the recipe book, there are like 8 different kinds of dough flavor to choose from, I just went with plain. :P Well, I figured that this is my first try, better just play safe a little. 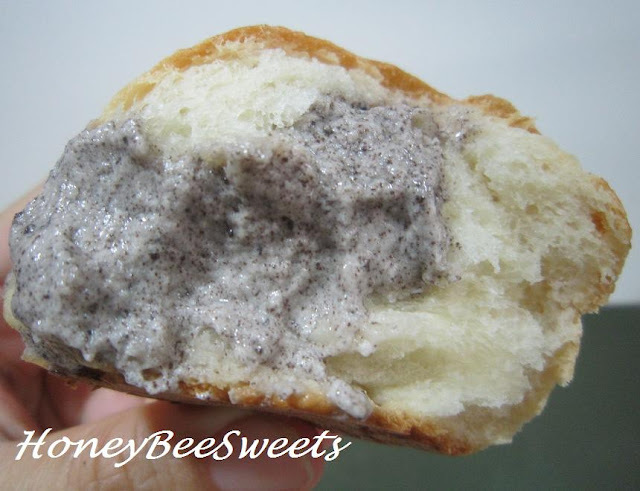 As for the filling, I made Oreo cream flavor since I knew the kids will enjoy it much better then plain sweetened cream. Let the dough proof in a greased bowl and cover it. Allow it to proof for at least 90 minutes until the dough doubles. 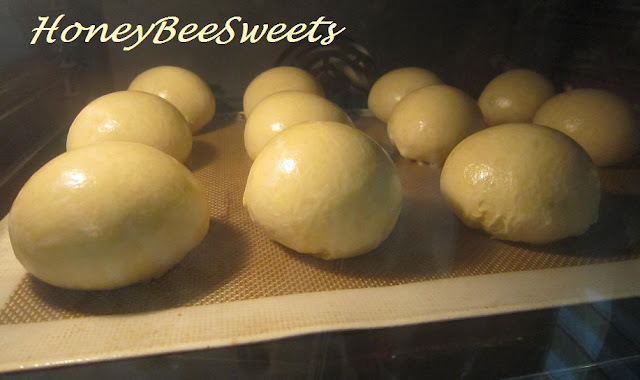 After proofing, punch out the air and divide the dough to about 40g each. Roll round and seal any open edges and let proof again for another 15 minutes. Preheat the oven to 180C and prepare a baking tray lined with parchment paper. 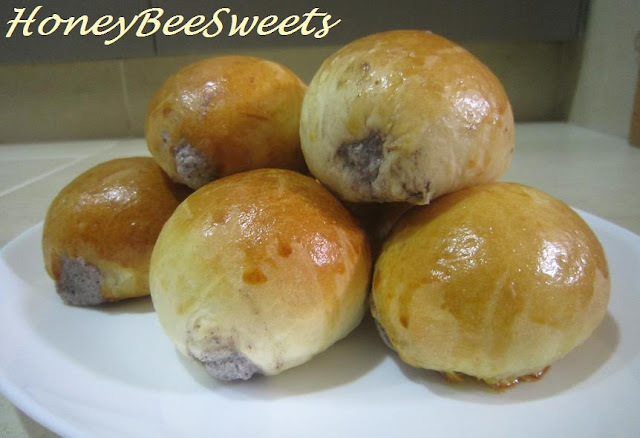 Brush the mini buns with egg wash and bake in the oven for 10 to 12 minutes till golden brown on the surface. Remove from oven and let cool completely. At the meantime, prepare the cream filling. 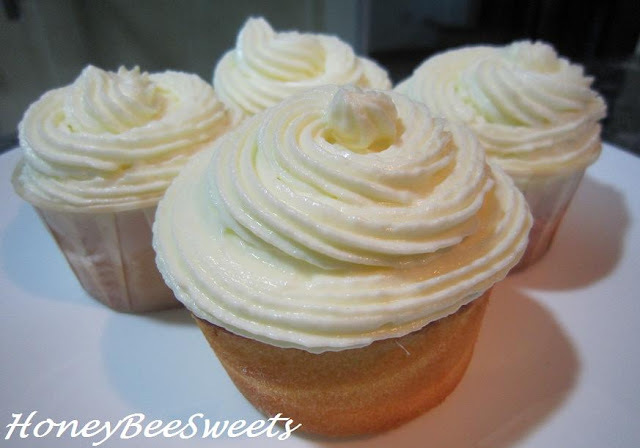 Whip the cream with the powder sugar till triple in volume and stiff peaks. Then gently fold in the Oreo cookie fine coolie crumbs in till evenly blended in. Chill the filling till it is needed. Using a piping bag and 1cm opening tip, pipe the Oreo cream into the cooled mini buns. Try not to squeeze too much filling in as it will ooze out. These little "babies" look like eggs from far! And as you can see I was greedy and piped in too much cream for some...so it looks like it's about to burst any moment, lol! Okay, signing off now...hope you all have a great great day ahead. Cheers all! 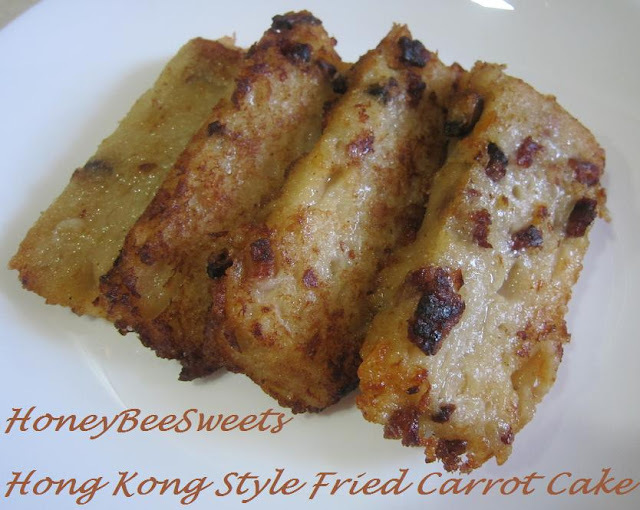 I am sure many of you out there, including myself of course have tried and love the Hong Kong style Fried Carrot Cake @ any Dim Sum restaurant. That dish is a MUST for my family because both my kids loves it and would sometimes just eat that during the whole meal. :P I have always wanted to replicate this dish at home but for some reason it was being pushed aside every time. :P After a dim sum session with the family a couple weeks back and seeing my girls again enjoying the carrot cake at the restaurant made me even more determined. :) Result was better then expected *phew* and I kept wondering why had I not made it earlier! In a large pot, add shredded carrot and water and start boiling mixture. Cook for about 5 to 8 minutes till the vegetables are slightly cooked. 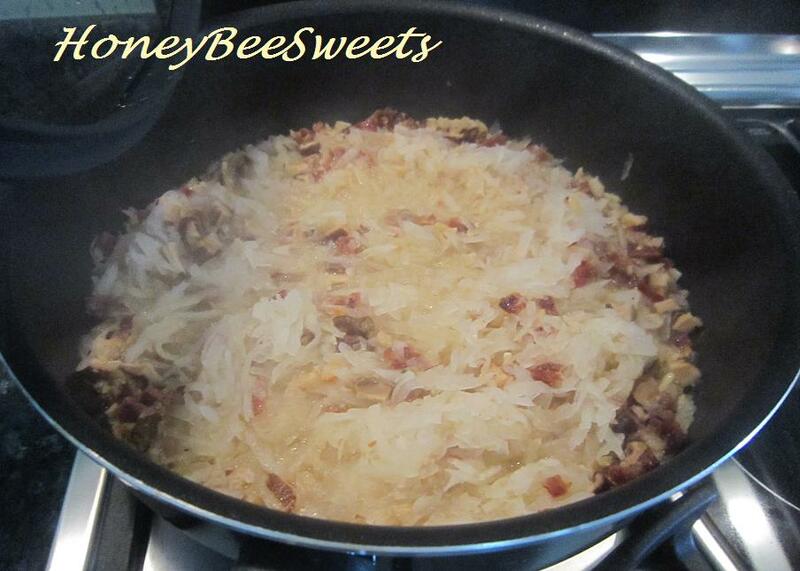 Do not throw about the water, leave the whole mixture together and set aside till needed. In a saute pan, add vegetable oil @ medium heat and stir fry the shallots till fragrant. Then add in Chinese sausage, mushrooms and dried shrimp. Cook mixture for a couple minutes then add the carrot water mixture in. Let it stew for about 8 to 10 minutes and then off the fire. Set aside till needed. In the meantime, prepare the steamer with rolling boil water and grease a 8" round steam pan lined with parchment paper. In a large mixing bowl, add rice flour, corn flour and wheat starch in. Pour in the chicken stock and mix well. Then pour the carrot mixture into the flour mixture and stir well. The mixture will be lumpy and thick. Pour it into the prepared steamer pan and let steam for about 40 minutes till cooked. Remove from steamer and let cool completely before cutting into it. 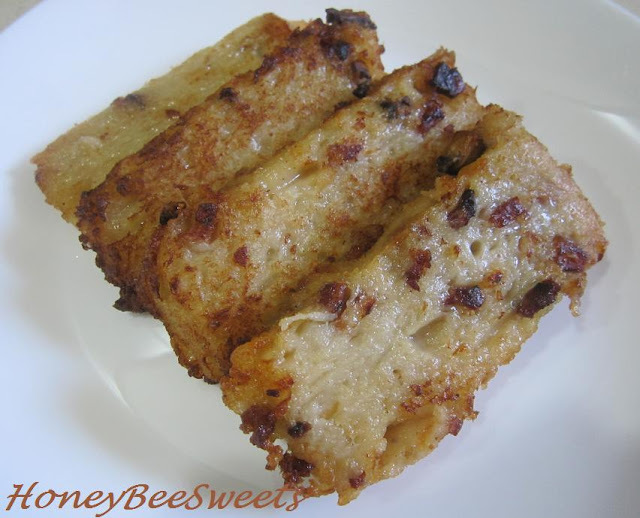 After cooling it, slice the kueh into about 5 am by 3cm rectangles. Prepare a frying pan and add enough cooking oil for frying the carrot cakes. I was pretty happy with the result. Even my younger daughter justified that by eating about 5 pieces! She kept saying "It's really good Mummy." Hahaha...I guess that all I needed to know. ;) We finished everything at one go! Guess the next time I make it will have to be double the recipe. ;) If you try it out, let me know how yours turn out okay? Happy cooking! Next item up is something that I have been "dying" to do for a long long time. 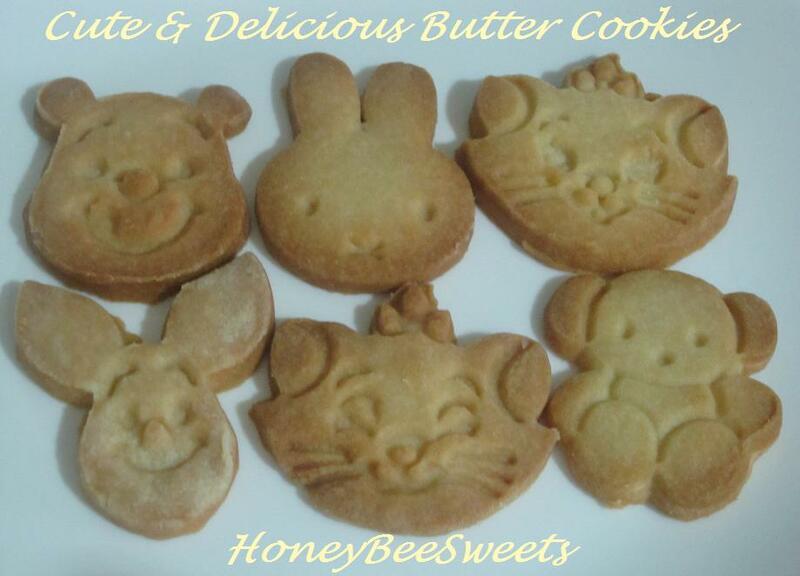 It's actually just simple butter cookies, but using cute cookie cutters to cut them out. :) Nothing special I know, but it;s so fun! BTW, I collect cookie cutters...I see I buy, a little out of control but I love all of them! Shh....don't tell okay, lol! I have many ( seriously many more) cutters that I have yet got a chance to try out, but anyway, here are just 6 of them today...cute right? Okay I admit I didn't do a good job on the cutting out for some...but I tell you it is not as easy as it looks! Some of the lines are so detail and fine, I had a hard time trying to remove cookie dough sucked in the cutter! 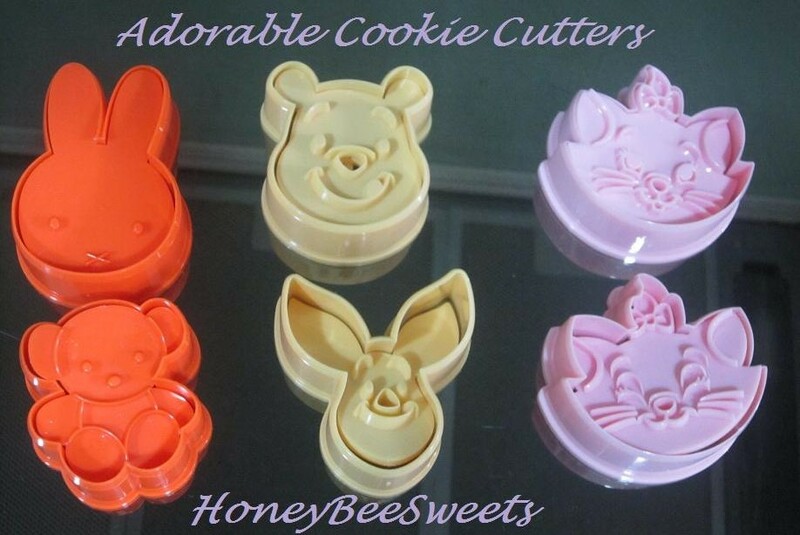 Here is a look at the cookie cutters themselves. Except for Miffy (the rabbit) and her bear friend (no clue the name), the rest are the usual Disney characters. If they come in Princess ones(i.e. Cinderella, Snow White etc)...I think my daughters will go crazy over them! Fact: You want the best; use the best. I loveX3 President Butter, it's literally cream of the crop of all the other brands. 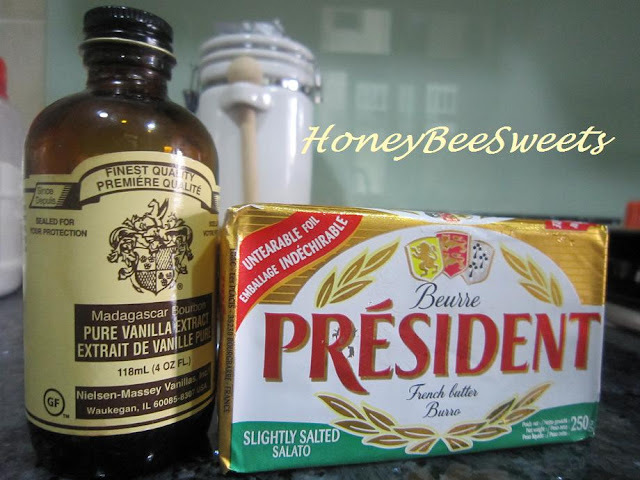 It's buttery fragrance is unbeatable and if I can, I would use it for all my recipes...that is if I can (~~$$$$$~~) :P And of course, Madagascar Pure Vanilla extract is always my top choice too. Wondering about my recipe? I actually used the same one for from my Linzer cookies, one of my fave of all time....yum! This is quite a delicate butter cookie recipe, I had to make sure I had to make sure not to use too much flour in the dough so as to make the cookie dough easy to handle. Simple, not really, I used up my whole afternoon doing these...just for 50 cookies. :P But knowing these cookies will be a hit, I finished my work with no complaints. 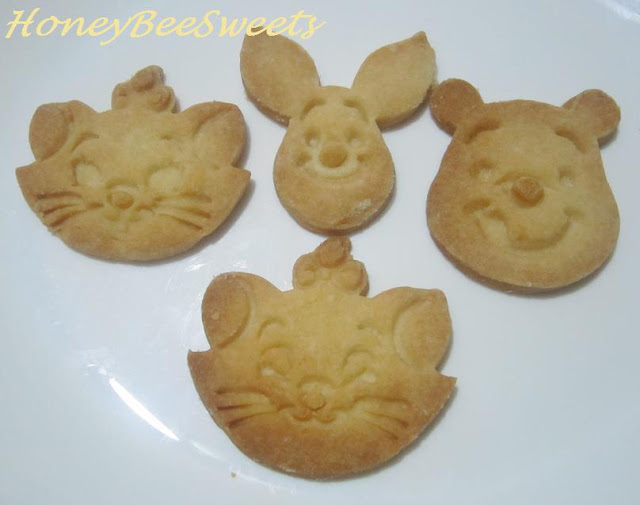 :P My kids LOVE them...asking one after another....choosing the cute characters and claim one taste better then the other(the cutter looking ones that is). :P I was really glad it was well received and of course it goes without saying you'll see more of it in my future posts. :) Try it and you will know what I mean. 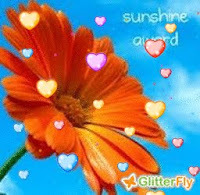 Okay all, got to go now my friends , you all have a good day! It has been so long, too long in my perspective since I last made fresh bread. 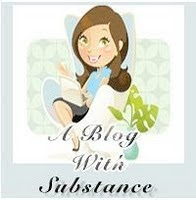 I have been waiting, holding back my "urge" to bake a batch that I would make myself contented. :) Why hold back you ask? It wasn't the right time and the right place as yet. Now that I am finally in my new house with my new oven and reunited with my KitchenAid mixer, it's one BIG happy reunion, lol! And alas the wait was all worth it! A few weeks back when my mom called me over for dinner, I knew the opportunity has arrived. 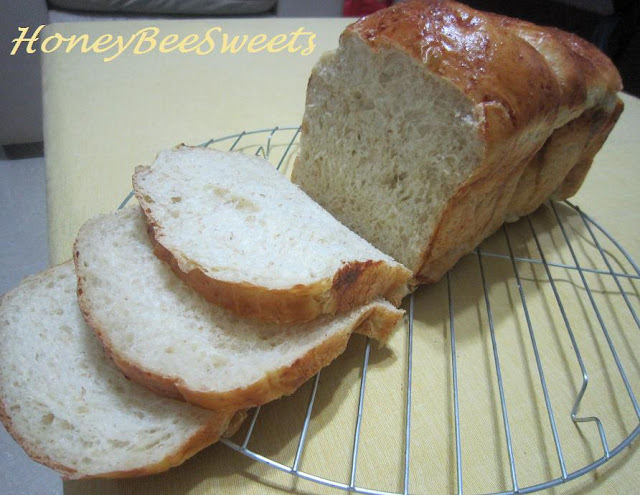 :) I had been wanting to make some nice bread for her and been delaying it for so long. 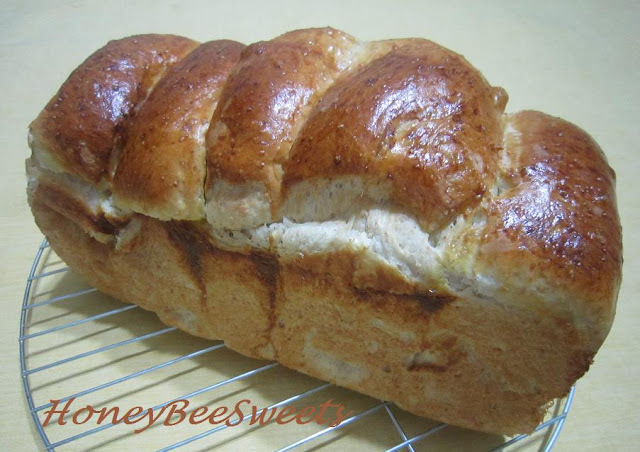 So I quickly went with one of my favorite soft bread recipe which I baked before from 孟老师的100道面包 and modified it a little and came up with this Soft Potato Wheat loaf bread. Since this recipe is similar to the one I have posted before, I will not be retyping it out again here in this post. The main difference is I had replace about 40 to 45g of wholemeal flour (Prima brand) from the bread flour in the dough recipe to make it a wee bit more healthy. 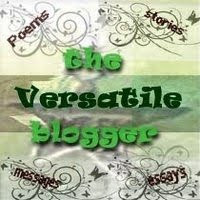 :) If you are interested to try this out, please kindly refer to my previous post. A glimpse of my breakfast (half eaten already...sorry) the following morning. Happy? Contented? 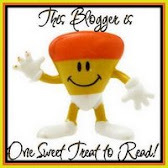 You bet I am, lol! You can have this too my friend, just get yourself in the kitchen and start baking. 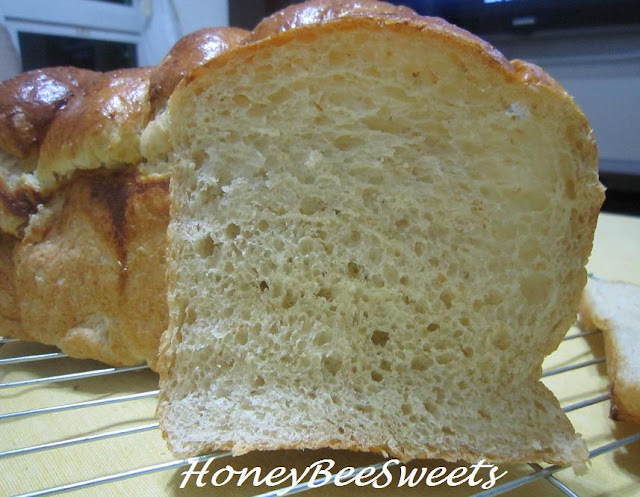 ;) No, no bread machine needed, just you and perhaps a good stand mixer (but your hands can do it too~!) will do. Even though it has been a super long wait of 6 months++, I was smiles again after this bake. Do try it out and let me know how it work out for you. 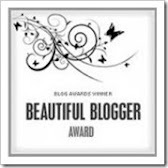 Thanks again to DG for these 2 lovely awards and wish I can be better blogger with much more interesting post in the future. Have a good week ahead to you all! Cheerios! This pound cake is very fine and to my opinion, as good as Sarah Lee (if not better) I guess the higher content of fat from the whipping cream does play an important part for this. 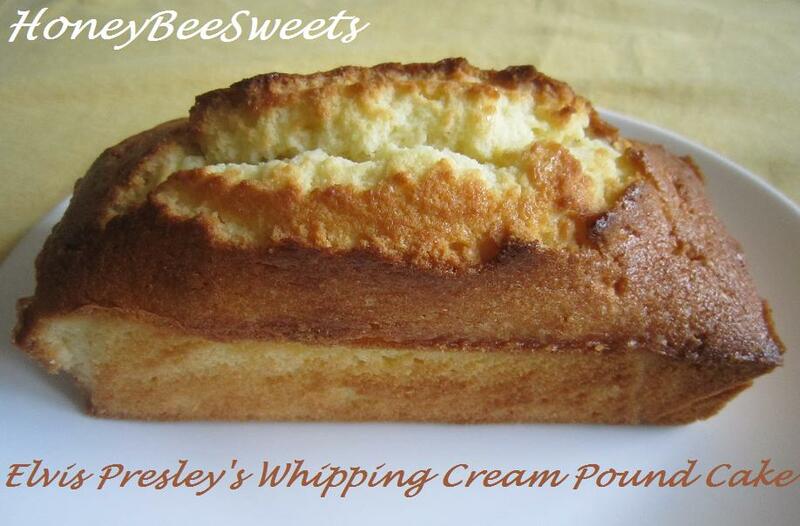 In a large mixing bowl, cream the butter and sugar together till light and fluffy. Sift the cake flour and salt together and set aside for use later. Preheat the oven to 180 and grease a loaf pan (9" by 5") and line with parchment. 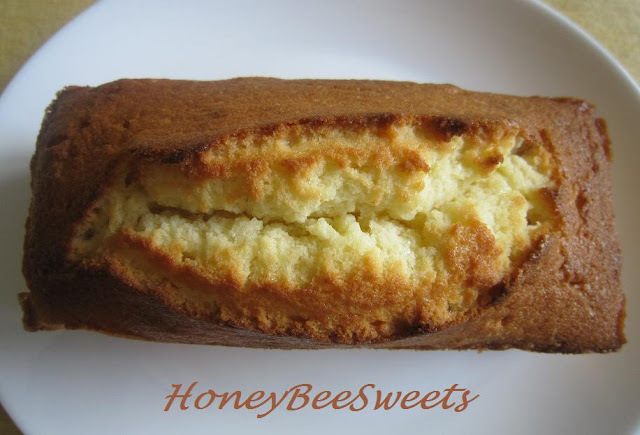 Crack an egg in to the butter mixture one at a time and mix well before adding in another. Add vanilla extract and mix well again. Then add 1/4 of the cake flour in and mix well. Now add in 1/3 of the whipping cream and mix. Repeat this, alternating flour and cream till all is mixed in. Pour the batter into the prepared pan and place in the oven to bake. Bake for at least 30 minutes or till the tester comes out with moist crumbs. 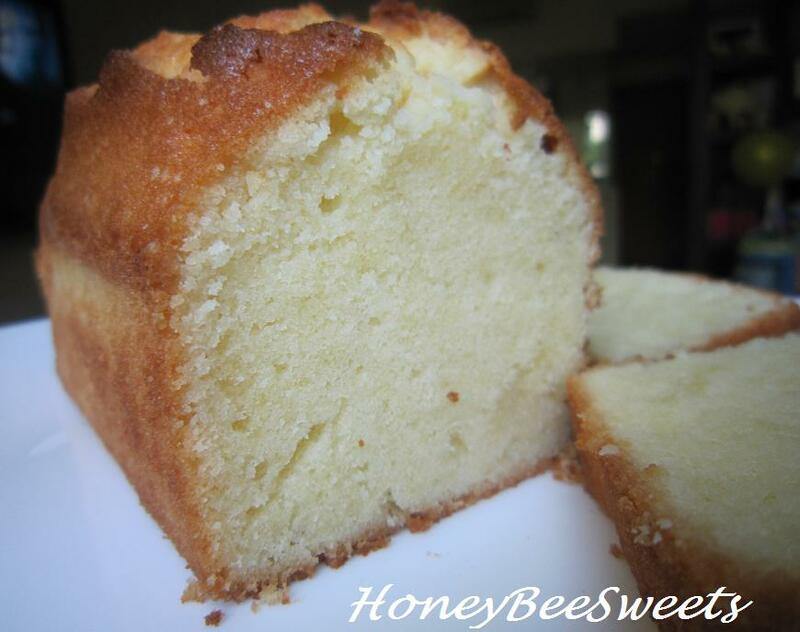 DO NOT over bake as it will make the cake slightly dry. 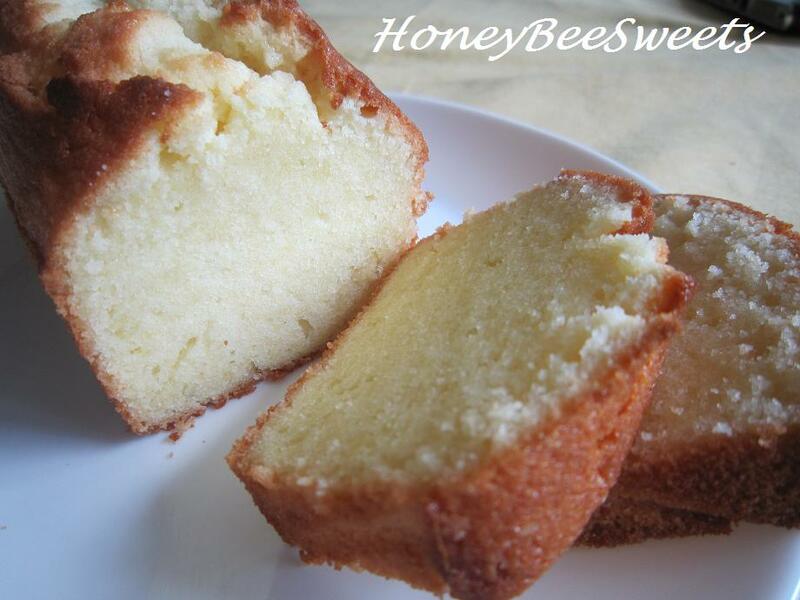 I have to say, up till now, this is my favorite butter cake of all. 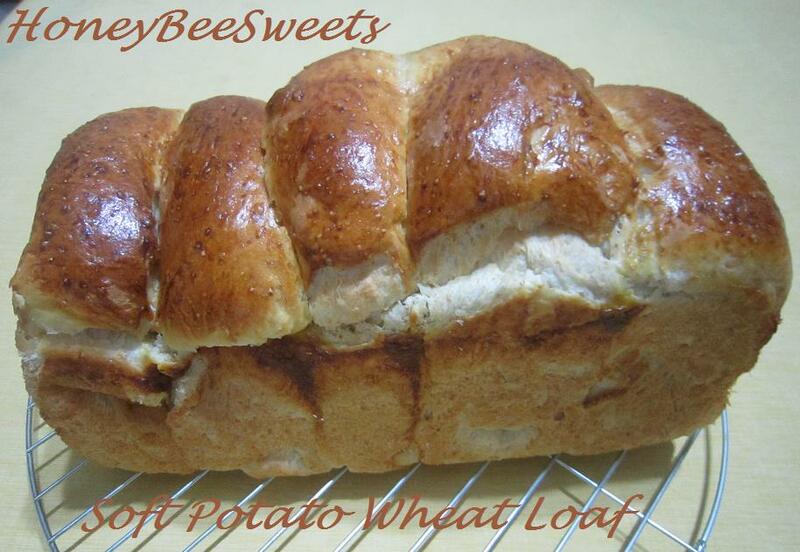 I would recommend you bakers out there to give this a try. :) What's life if you can't indulge a little?! This is great for tea or anytime! So go bake some today. ;) Make Elvis proud! ;) Have a super weekend all! It's almost a decade since I last made bagels. And a warm toasted bagel with a generous spread of cold cream cheese is a breakfast that me and my husband love much when we were back in California. The unique chewy texture of this bread is good to munch on plus the crunchy toasted crust is very good too! 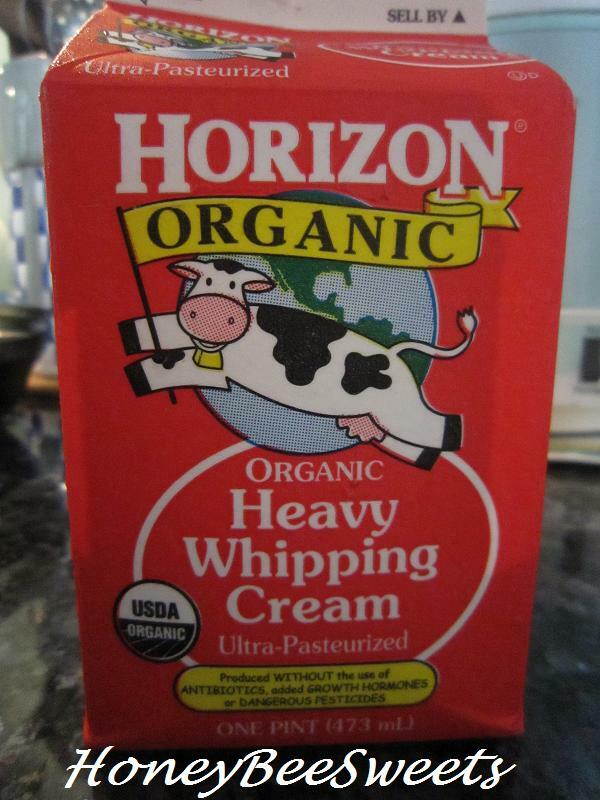 Much to your preference, you can it served with savory lox or just sweet cream cheese, it's quite versatile & delicious. But I do know that not everyone likes bagels. Normally people would prefer fluffy soft bread and not chewy dough like bagels. I remember the first time I had bagels, I didn't quite understand why people like it, lol! As time goes, I got to taste really good ones and finally acquire a fondness for it. 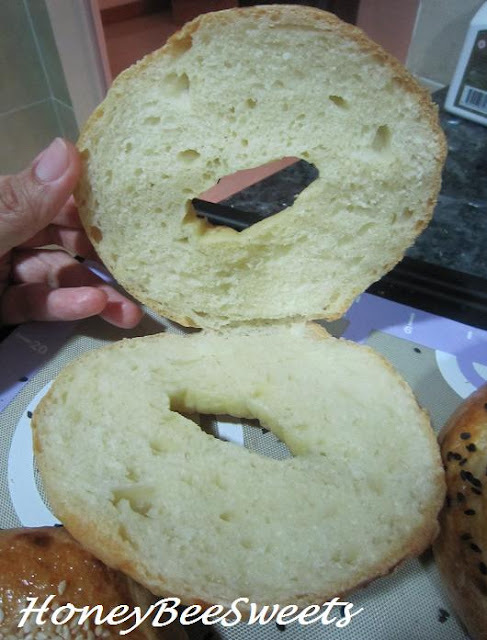 However it is not easy to find freshly baked bagels here in Asia. 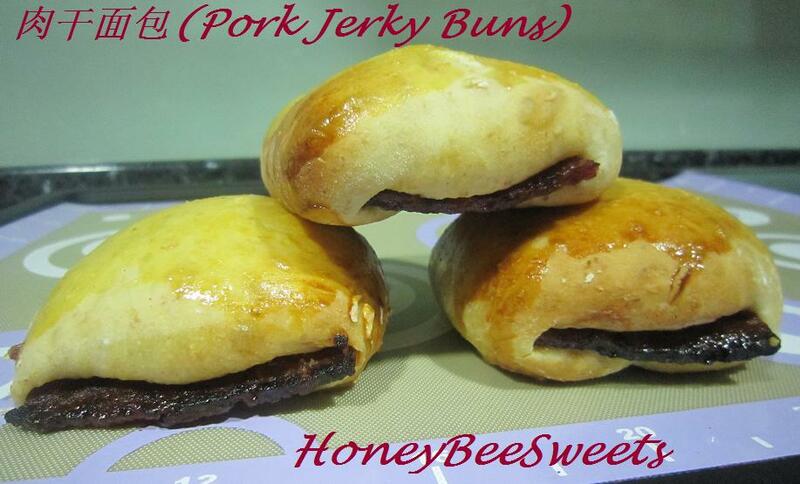 So I decided to give my hubby a surprise and made a batch for it for breakfast one morning. 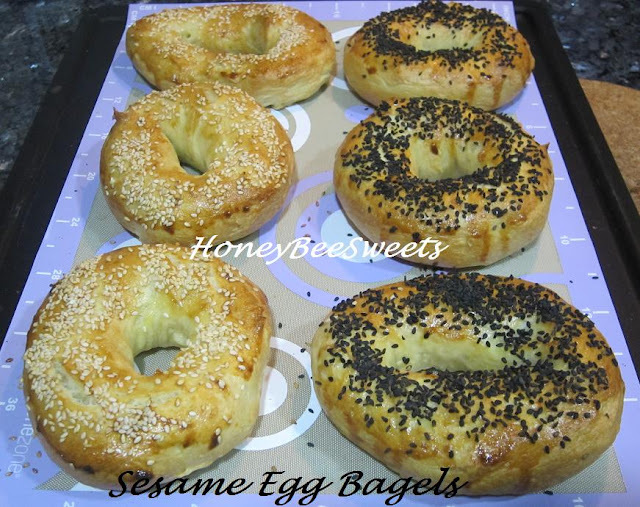 :) I made Sesame Egg Bagels. 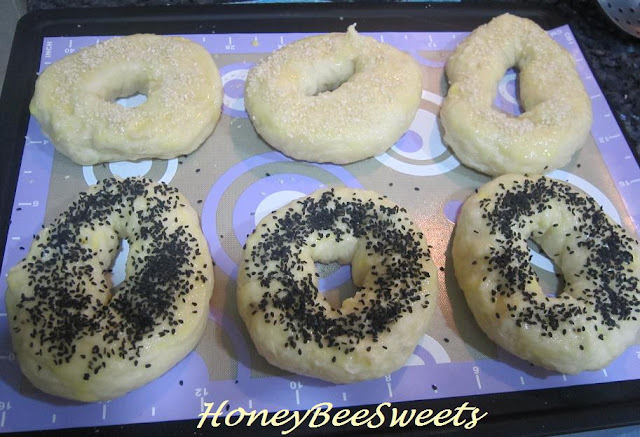 I was elated when these 6 lovely loops came out from the oven. All nice and golden brown, yum! 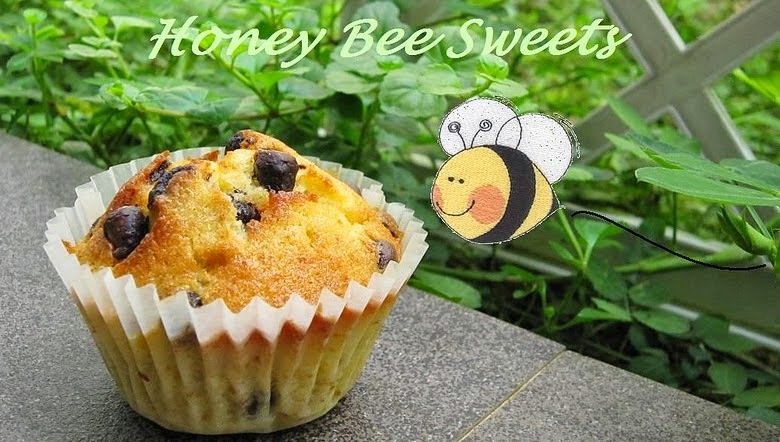 This is really something you can't get from your local bakery in Singapore...as far as I know. Cook the potatoes in the water and bring to a boil. Cook till the potatoes are fork-tender, about 8 to 10 minutes, reserve the water. Let cool till lukewarm. Measure 1 cup (250ml) of the potato water and pour it into a large mixing bowl. Add yeast, oil and eggs and whisk till well combined. Add in the flour and salt, knead mixture till it becomes a soft dough. Continue to knead the dough till it is elastic and non sticky, about 5 to 7 minutes. Placed the dough in oiled bowl and cover with plastic wrap and let proof for at least 1hr or till the dough doubles in volume. Punch out the air and turn out on a lightly floured surface. Cut the dough into 6 equal parts. Roll round and cover to rest for another 10 minutes before shaping. Take a portion of the dough and using your palms, roll each piece into a rope of about 10". Using the heel of your hand, flatten 1" of one end of the robe (See Step A). Form each bagel by overlapping the flat end of the rope over 1" of the round end (See Step B). Pinch together to seal. Repeat till all the bagels are formed and place them on a lightly floured surface. Cover and let proof for another 15 minutes. Preheat the oven to 210C and line a baking tray with parchment paper. Fill a large pot with about 3/4 full of water and bring to a boil over high heat. 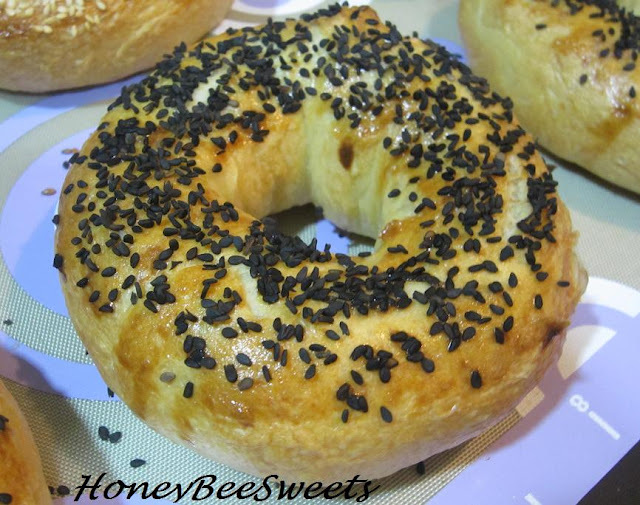 Reduce the heat to a simmer and lower 3 of the bagels in the water. Do not overcrowd them as they might loose their shapes. Simmer for 1 minutes and turn them over to simmer 1 more minute. Transfer the bagels on the prepared baking tray, spacing about 1" apart and repeat the boiling for the remaining 3 bagels. Brush the bagels with egg wash and sprinkle with sesame seeds. Bake in the oven till golden brown for 25 minutes. Transfer to rack to cool completely before serving. I sliced open one once it was out of the oven. :) Crusty outside and soft inside...yummy! 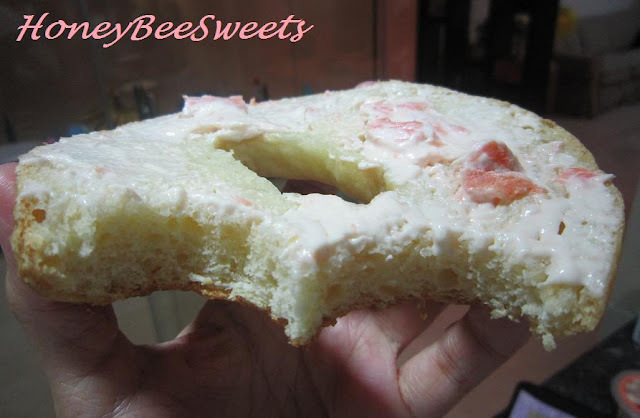 I spread on some lox (smoke salmon) cream cheese on it and munched away, lol! Apologies for the poor quality of this photo. 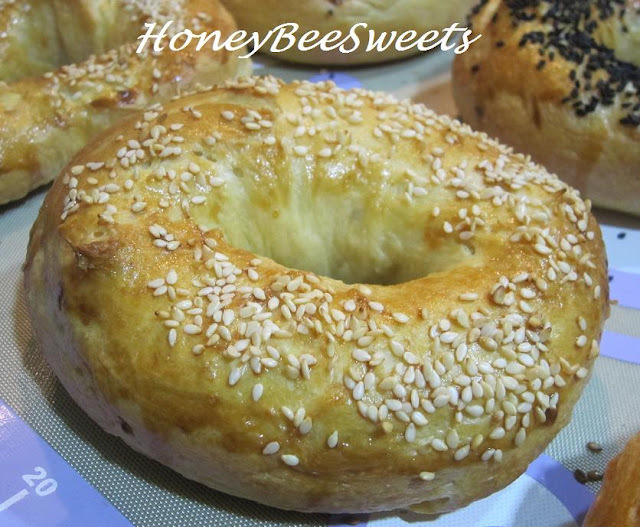 :P Anyway, I hope you all that like bagels will also try out this recipe. 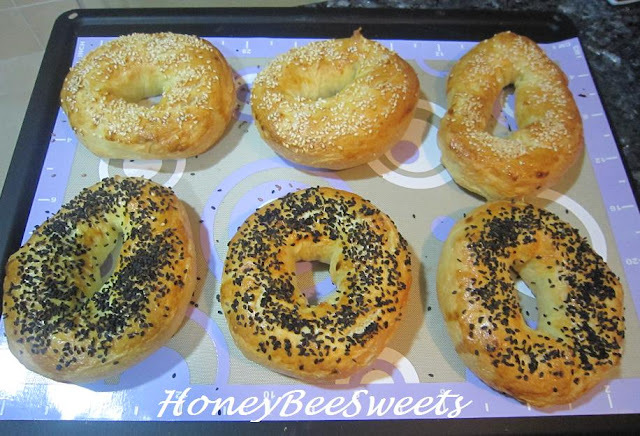 If you can't finish all the bagels, just refrigerate up to a week or freeze up to a month. Toast it up in the oven before serving...remember to get your favorite spread of course. ;) Bon appetito all!